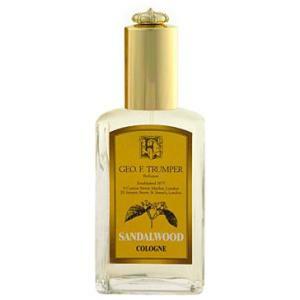 Sandalwood Cologne is Trumper's most traditional and popular fragrance. It opens with citrus notes of Bergamot and Lemon combined with Lavender, Clary Sage and spice notes that lead into a floral heart comprised of white Jasmine, Carnation, Geranium and Rose. All this is supported on the base notes of Sandalwood, Patchouli, Amber, Vanilla and a hint of Leather. This sophisticated fragrance lasts and lasts. Sandalwood is a very rare and precious perfume and its popularity has caused many substitutes and inferior preparations to be produced. To uphold Trumper's tradition of excellence, the Sandalwood oil used is only of the very highest quality and originates from the mountainous Mysore area of India, the centre of the World's Sandalwood production, where it comes from a strictly regulated source. Several years ago I contracted a sensitivity to a constituent part of Pine Resin which, I discovered to my cost, is used as a binding agent in around 70% of manufactured goods, including most commercial fragrances. In order to avoid coming out in an extremely irritable rash, I was forced to find cosmetics which were natural but long-lasting. 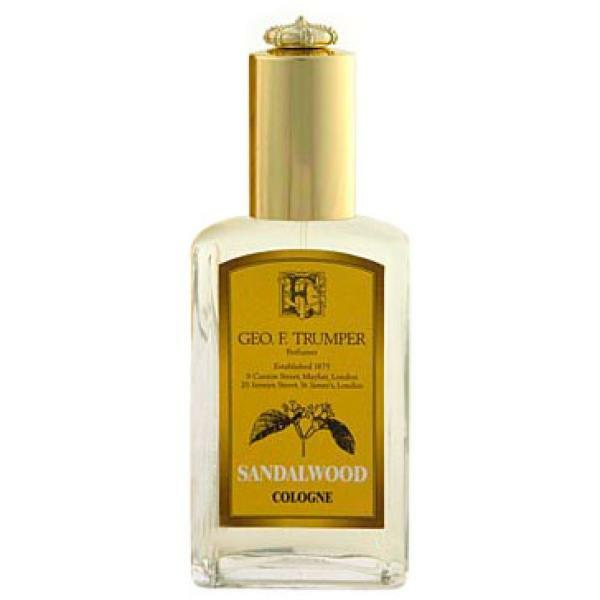 The Sandalwood Cologne and accompanying range (by Trumpers, nobody else's works) fitted the bill wonderfully - a manly essence with no reaction on my skin at all and still discernable at the end of the day. It's not the cheapest but it is the only one that works for me. The initial blast of this is quite sharp but rapidly mellows into a warm woody scent which isn't overpowering if used sparingly, but has good staying power. Feels solid and traditional but not stuffy. Nice scent. Classic sandalwood and suits the autumn and winter well. A small amount will last you all day, but I found too much to be a little overpowering. Have been looking for a Cologne to replace Aramis classic which I have used for years and with this Cologne I have found it at last. It is a mans fragrance. Many of today's Fragrances seem to be somewhat effeminate or too fruity. Sandalwood gets the right balance and is long lasting. Would recommend. Fantastic!! I use this each morning, before work or after the gym and find the fragrance is exceptional! The Sandalwood is warm and rich and refreshes itself when you get warmer also lasts throughout the day. The best bit is my wife loves it! This is a great smelling fragrance for an evening out as it is quiet heavy. Which is good because even after being in a Smokey atmosphere you can still smell it. If you like Sandalwood fragrances for the day, Trumpers Astor is also great just a little lighter. This is gold in a bottle, i was not sure on this fragrance by looking at the bottle and the make, but the smell is very nice and has become my favourite aftershave. Buy it ! !